Everyone seems to love word clocks. Maybe it’s the mystery of a blank surface lighting up to piece together the time in fuzzy format, or maybe it hearkens back to those “find-a-word” puzzles that idled away many an hour. Whatever it is, we see a lot of word clock builds, but there’s something especially about this diminutive PCB word clock that we find irresistible. Like all fun projects, [sjm4306] found himself going through quite the design process with this one. The basic idea – using a PCB as the mask for the character array – is pretty clever. We’ve always found the laser-cut masks to be wanting, particularly in the characters with so-called counters, those enclosed spaces such as those in a capital A or Q that would be removed by a laser cutter. The character mask PCB [sjm4306] designed uses both the copper and a black solder mask to form the letters, which when lit by the array of SMD LEDs behind it glow a pleasing blue-green color against a dark background. Try as he might, though, the light from adjacent cells bled through, so he printed a stand that incorporates baffles for each LED. The clock looks great and even has some value-added modes, such as a falling characters display a la The Matrix, a Pong-like mode, and something that looks a bit like Tetris. Check out the video below for more details. We’ve seen word clocks run afoul of the counter problem before, some that solved it by resorting to a stencil font, others that didn’t. We’re impressed by this solution, though, enough so that we hope [sjm4306] makes the PCB files available so we can build one. Returning a piece of retro hardware to factory condition is generally a labor of love for the restorationist. A repair, on the other hand, is more about getting a piece of equipment back into service. But the line between repair and restoration is sometimes a fine one, with the goals of one bleeding over into the other, like in this effort to save an otherwise like-new Amiga 2000 with a leaky backup battery. Having previously effected emergency repairs to staunch the flow of electrolyte from the old batteries and prevent further damage, [Retromat] entered the restoration phase of the project. The creeping ooze claimed several caps and the CPU socket as it spread across the PCB, but the main damage was to the solder resist film itself. In the video below you can clearly see flaky, bubbly areas in the mask where the schmoo did its damage. Using a fiberglass eraser, some isopropyl alcohol, and far more patience than we have, [Retromat] was able to remove the damaged resist to reveal the true extent of the damage below. Thankfully, most of the traces were still intact; only a pair of lines under the CPU socket peeled off as he was removing it. After replacing them with fine pieces of wire, replacing the corroded caps and socket, and adding a coin-cell battery holder to replace the old battery, the exposed traces were coated with a varnish to protect them and the machine was almost as good as new. Amigas were great machines in their day and launched more than one business. They’ve proved their staying power too, some even in mission-critical roles. The ambitious etchr – the PCB Printer is just a concept at the moment, but it’s not often we see someone trying to tackle desktop PCB production in a new way. Creator [Jonathan Beri] is keenly aware that when it comes to creating electronics, the bottleneck for most workflows is the PCB itself. Services like OSH Park make professionally fabricated PCBs accessible at a low cost, but part of the bargain is that turnaround times are often measured in weeks. [Jonathan]’s concept for etchr is a small system that automates not only etching a copper-clad board with all the attendant flooding and draining of chemicals, but applying a solder mask and silkscreen layer labeling as well. The only thing left to do would be to drill any required holes. The idea behind etchr is to first take a copper-clad board with photoresistive film or spray applied to it, and fix it into a frame. A UV projector takes care of putting the traces pattern onto the board (and also handles a UV-curable solder mask in a later step) and the deep frame doubles as a receptacle for any chemical treatments such as the etching and cleaning. It’s an ambitious project, but the processes behind each step are well-understood and bringing them all together in a single machine is an intriguing approach. Desktop production of PCBs can be done in a few ways, including etching via the toner transfer method (whose results our own Elliot Williams clearly explained how to take from good to great). An alternative is to mill the PCBs out directly, a job a tool like the Othermill is designed specifically to do. It’s interesting to see an approach that includes applying a solder mask. The cheapest PCBs – and therefore most common – are green solder mask with white silkscreen. It works, but it’s also incredibly boring. This is the way things were done up until a few years ago with the explosion of board houses trying to compete for your Yuan, and now getting a red, yellow, black, blue, green, and even OSH purple is possible. This doesn’t mean multiple solder masks aren’t possible, as [Saar] demonstrates with his demonstration of multicolor solder masks and circuit love. We’ve seen a lot of [Saar]’s designs, including a mixing desk, a cordwood puzzle, and an engineer’s emergency business card, but so far his artistic pieces have been decidedly monochromatic. For this build, [Saar] teamed up with Eurocircuits to create a board that exploits their capabilities. Althought Eurocircuits has PCB PIXture, a tool for putting graphics on PCBs, [Saar] made this with his own tool, PCBmodE. The design of both the red and yellow variants are abstract, and only meant to be a demonstration of what can be done with multicolor solder mask. It looks great with five backlit LEDs, and with an acrylic top and bottom, makes a great coaster or art piece. We like [Saar’s] work so much that we put his Cordwood puzzle in the Hackaday Store. Making PCBs at home is a great means to get your prototype up and running without having to wait weeks for a professionally made board. Regardless if these prototype boards are milled or etched, they are easily identified as ‘home brew’ due to their ‘unfinished’ appearance. [HomeDIY&Stuff] has put together a little how-to on the process for making DIY PCBs look a little closer to a professionally manufactured board. The process starts out with designing the board in a PCB program. There are a lot of these programs available. Eagle is a popular choice and has a free version available. Once the layout it finalized, the design is printed out on a transparent sheet of plastic. 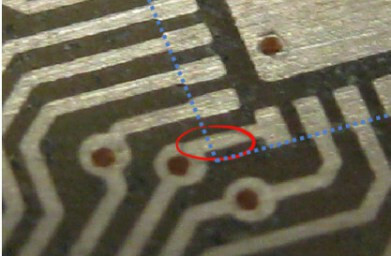 A blank copper-clad PCB board that already has a UV sensitive coating applied are available for purchase and is what is used in this example. The transparency is placed over the PCB blank and then exposed to UV light. The coating on the PCB cures where ever the UV light passes through the open areas of the transparency. Once the transparency is removed, there is a noticeable difference in coating color where it has cured. This board is now placed in a developer solution that removes the un-cured UV sensitive coating. A Ferric Chloride acid bath then etches away at the now-exposed copper. The cured coating from the previous step protects the copper at the trace locations during the etch process. The result is a board with copper where you want it and none where you don’t. If the board has any through-hole components, this would be the time to drill those holes. Up to this point the process has been pretty standard for homemade PCBs and the next part is certainly the most interesting but, unfortunately, is also the worst documented step; the solder mask and silk screening. It appears that two silk screens are produced, one for the solder mask and one for the silk screen. The artwork for making the silk screens can be output from the PCB design software. There is no mention of the solder mask material used but oil-based silk screen ink is specified. Although the details are lacking, the photos show that it works pretty well. If you have had any experience with silk screening DIY PCBs, let us know in the comments.